ARLINGTON, Texas -- Cole Hamels understood not getting to finish the eighth inning of his debut with the Texas Rangers. Hamels, who threw a no-hitter in his final start for Philadelphia, walked off the mound with a three-run lead over the San Francisco Giants after giving up a two-run double on his 97th pitch Saturday night. Three batters later, the score was tied, and the Rangers went on to lose 9-7 in 11 innings. "All of us in this situation, we always want to go as long as we possibly can," Hamels said. "I respect the decision and understand it. ... It's always nice to see guys that come in who are fresh. Sometimes it doesn't work, and sometimes it does." Reliever Tanner Scheppers then allowed three consecutive run-scoring hits to the only batters he faced, and the Giants tied the game at 7-7 on Hunter Pence's RBI single. Pence, who grew up and went to college in Arlington, led off the 11th inning with a tiebreaking homer. Exactly one week after he no-hit the Chicago Cubs at Wrigley Field on 129 pitches, Hamels gave up eight hits and five runs to the Giants - who on July 10 at home had nine runs and 12 hits in 3 1/3 innings against the left-hander. The Rangers completed an eight-player deal Friday to get Hamels, who is signed through 2018 with a club option for 2019. "It's crazy. Getting here and getting ready for the game, you try to keep to your routine but at the same time it's a new clubhouse. It's a lot of new beginnings so you have to kind of find yourself, especially after only being here 24 hours," Hamels said. "But when you get onto that field the excitement is great." Brandon Belt homered twice for the Giants, who have won 14 of their last 17 games. Belt led off the third with his 11th homer, and added another solo shot in the 11th off Sam Freeman, who hadn't allowed a run in his previous 17 appearances. Hamels struck out six and walked one before Scheppers surrendered back-to-back doubles to Matt Duffy and Buster Posey before Pence's tying hit. "It was definitely unfortunate," Scheppers said. "Cole pitched a hell of a game and did such a great job. ... Just wasn't my day." New Rangers catcher Bobby Wilson, obtained on a waiver claim from Tampa Bay on Friday, had a pair of RBI singles. Mitch Moreland drove in three runs, with a first-inning double and a sacrifice fly. Dyson, who was 3-3 for Miami before being acquired prior to the non-waiver trade deadline, gave up a leadoff single in the 10th before three consecutive groundouts - against the Giants' Nos. 2-4 batters. Hunter Strickland (2-1), the seventh Giants pitcher, threw two scoreless innings before Santiago Casilla worked the 11th for his 27th save in 31 chances. Strickland has pitched 12 2/3 scoreless innings over his last 14 appearances. 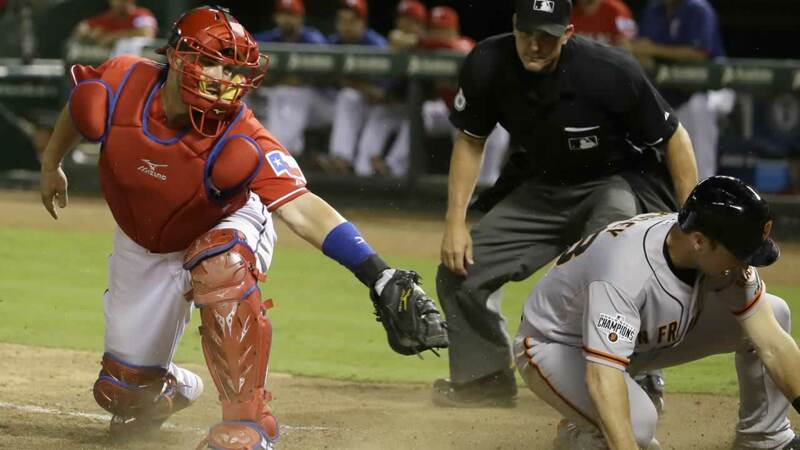 Hamels started with two no-hit innings before Belt's homer just beyond the reach of the glove of leaping center fielder Delino DeShields, who an inning earlier caught Posey's towering flyball against the wall. Belt's first homer was the first of five hits in a span of seven batters for the Giants. "(Hamels) threw well, but we had some good at-bats, especially the one inning," Giants manager Bruce Bochy said. "I thought he was on the top of his game. I know we scored off him, but I thought he had really good stuff." Like 2008 World Series MVP Hamels, Giants rookie starter Chris Heston threw a no-hitter this season. Heston, who was 5-0 with a 2.11 ERA his previous seven starts, gave up seven hits in 4 2/3 innings. After Posey had a leadoff single in the fourth, he was retired on a double-play grounder and Hamels didn't allow another base runner until Posey's 15th homer leading off the seventh.